In this lesson, we will look at vamps over minor chord progressions. Similar to the major grooves lesson, we will start with simple examples and gradually build up the complexity. We will explore the minor 25, the minor 251, and some interesting circular chord progressions. Experiment with these different tones and the unique colours they produce. You can use approach notes in your basslines to add additional movement and interest. 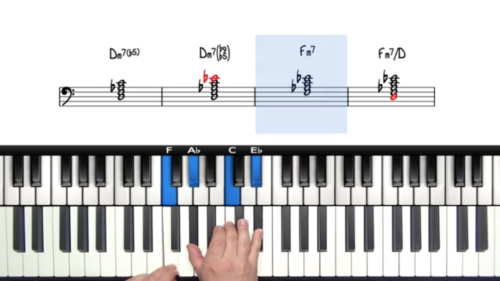 This can be achieved with full step approach notes, and also half step chromatic approaches. In the lesson, we will look at combining both half and whole steps to approach the chord changes. Chord Melodies – Make Your Chords Sing! Choose your right-hand voicings wisely so that the top note of each voicing creates a melodic line. These lines can be complex or simple – all depending on the situation and setting. ‘Chord Melodies’ are a nice way to create counterpoint to the main melody of the song. 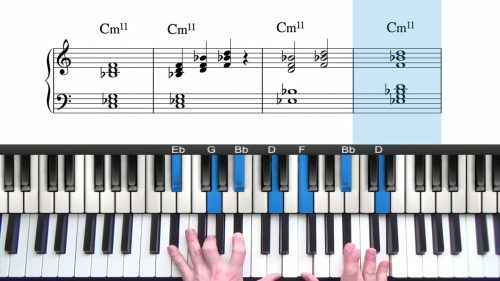 Study the examples provided and experiment with this technique when comping through a chord progression. We finish this study of minor grooves with the 251 and 1625 progressions. By applying these progressions over a 2-bar vamp, we will demonstrate the concepts and principles covered in the lesson. 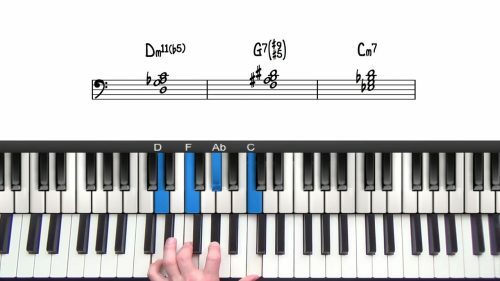 In this lesson, we explore the minor 25, and how to use our chosen melody over any minor 25 progressions and also the tune we are studying. In this lesson we are going to look at some alternative ways to voice minor 251s with our left hand. We introduce the -11b5 chord and its inversions. We have voiced minor 251 progressions with our left hand and so now it’s time to spread the notes across 2 hands to get bigger chords with more impact! Experiment with the different colour tones over the V7 chord. Add lyricism to your basslines with approach tones and other patterns. The top note in your chord voicings can be used to create a moving melody line. Practice creating simple chord melodies, and also more advanced ones as outlined in the lesson. When 'making your chords sing', try to alternate ascending and descending notes, and small and big intervals. This will sound a lot more musical than simply running up and down a scale.